White and black atoms on blue background. 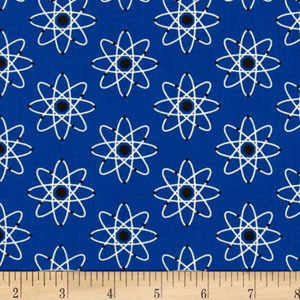 Each atom is 1.5 inches across with a fabric repeat every 1.75 inches. New, straight from the bolt, 100% high quality quilter's woven cotton, 44/45 inches wide. From the Mod Geek fabric collection by Robert Kaufman Fabrics.